New Participant: You will have to make a mini handmade journal with a minimum of 10 pages (max. size is 5x7, around 2 - 3 ounces) that will be sent to your partner. Make sure your name, username and address is on the last page so it can be returned to you when it is full. This book is going to be used for MIXED MEDIA so please make sure that your book is made of a sturdy paper that can hold up to some beating. You can decorate the first spread of pages (please use a previous swap's prompt) if you choose, but it's not mandatory. Rating is set at 4.97. I will check profiles and I reserve the right to ban anyone I consider a risk: unexplained 1s or 3s in the last 6 months, anyone who hasn’t been active for the last 3 months, No newbies (anyone on swap-bot less than 6 months). If you are in one of the above mentioned categories but feel you should be allowed to join, message me. Returning Participant: Decorate and send out your mini-book from the last round (R36 theme was: Floral. Remember, the journal GOING OUT in this round should have the floral prompt). When you receive your mini-book from your partner in this round, you will be required to complete one (1) full page spread (one left side and one right side) based on the prompt given. Don't forget to add your username, date and country to your layout somewhere. You will then hold on to the book until the next partner is assigned and send it to them. When the book is full you will need to return the book back to it's original owner. Message Swap Coordinator GOTHBARBIE to facilitate. PROMPT: Favorite Beverage! Summertime sweet tea, hot tea, coffee, soda pop or milkshake. Make some art about that favorite drink! Remember: this prompt will go in the book you RECEIVE this round!! Don't like the current theme? use an old one that's not in the book yet! Rating: if you receive a book from your partner with one full spread decorated (one left side, one right side) in a reasonable amount of time, please rate a 5. Only rate a 1 if you did not receive anything. Please comment below with the journal owner's name/ID. Also comment with tracking info once you send! Thanks!!! I have @JustMeCreating to send out this round! i have @Germanbaby77 s to send out this round. I have joan northwood's. It does not have her swap name listed. Will send out this round. THANK YOU EVERYONE THAT COMMENTED! Anyone else reading this - please comment with the journal you have right now. Thank you! I have Nina V. Loeper’s journal. I don’t see her swap name. hi i have RAVEN IACONO. This journal has duplicates of prompts, so ill do something from the list. I have the journal of teresa mask (teresa110-recycle). I Will send it to lynnerfb. I have Rian Helmgarter’s (almost complete!) heading to @LadyRisa this round! Tracking will be emailed to protect recipients’ privacy. I received riam’s Journal. Will send on next round. I sent @gothbarbie ��s journal to @ justmecreating in Denmark. I was given #LC936352984US, but was told I could only track it until it left US. I created a new mini journal and sent it to @thebragal I didn't get a tracking # because it was going to cost me $20 to track internationally for some reason. Received Dakotadee"s journal from her. 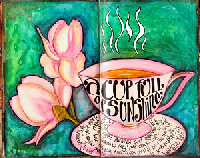 I passed @travelgirlem s art journalR36 and received Connie Terry's book R37. I wonder where my art journal is by now?